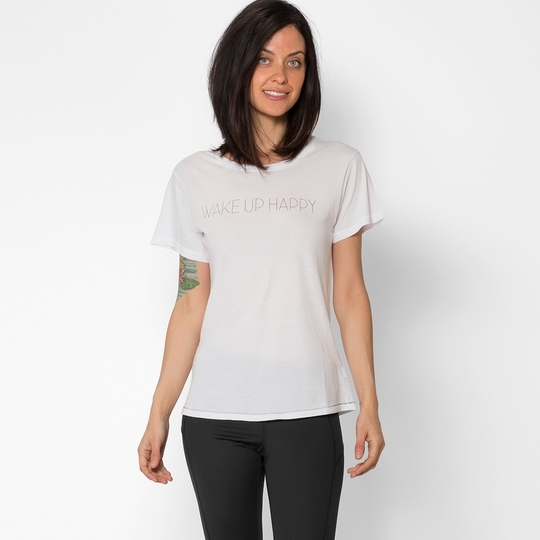 The Wake Up Happy Tee from All Things Fabulous says it all. This short sleeve tee has a simple message that brings a smile. Soft fabric makes it super comfy - from yoga to meditation to hanging out, this go everywhere tee sparks positivity. A local Venice Beach label, All Things Fabulous is your go-to for comfortable clothing with imaginative style. The brand was launched in 2012 with all products being made in its hometown, Los Angeles. Incorporating a different story into the collection each season keeps ATF fun, original and interesting. The brand consists of comfortable tops, intimate sweats, dresses, and graphic tees, all of which are made in the USA. Appropriate for any occasion, the pieces have a hip, California comfy feel to them. All Things Fabulous utilizes step and repeat printing, which is an innovative graphic design process. The brand is known for "taking a whimsical approach to photography printing." Since all of the products are manufactured locally in the US, the brand is conscious of the unethical working conditions around the world and is careful not to contribute. All Things Fabulous is unique for their ability to make you feel comfortable and fashionable simultaneously, which doesn't happen often.